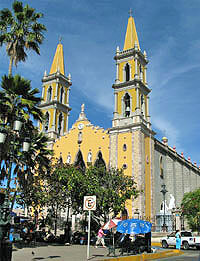 Mazatlan City Tour - See Mazatlan and Save! There is no better way to see the sights of Mazatlan than this excellent city sightseeing tour. Your expert English-speaking guide will show you the most important parts of the city (see right), showcasing their knowledge and personality with the narration they provide. After exploring the outer areas of Mazatlan like the Golden Zone, you'll enjoy a fun walking tour of the oldest part of the city, the historical center, where your guides will explain to you the history and culture behind the buildings of this area. This tour makes a great cruise excursion, or an excellent get-acquainted activity on your vacation! 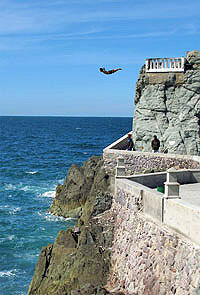 See the sights of Mazatlan's Golden Zone, including the Marina, the Malecon, and the exciting Cliff Divers! Our Expert English-speaking guide will show you around the city, providing interesting narrative and answering your questions about Mazatlan. Go on a fun walking tour of historical downtown Mazatlan, where you'll see the city's most famous buildings, and enjoy the public market. Cruise Passengers: Yes! This tour makes a great shore excursion. Pick-up and drop-off from your Cruise ship pier is included in the price! Runs: Monday through Saturday at 10:00 AM and 2:30 PM. Duration: 3.5 Hours Approximately, including transportation. Kids: All ages are welcome. Kids age 3-9 are half price. Kids under 3 are free. "Our walking tour in Mazatlan was so informative and between the air conditioned van and walking the historic streets we loved our guide. She gave us a real insider's view. Thank you for the wonderful value and unforgettable memories!"